RedMi Note 4 Explodes: The Smartphones catching fire is not new, but they explode most of the time while being re-charged. 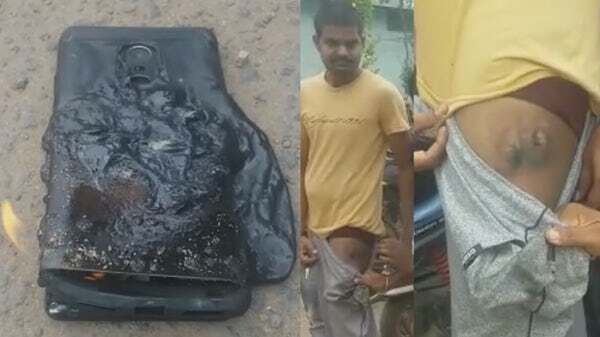 In a bizarre incident, a RedMi Note 4 smartphone exploded in the pocket of a user in Ravulapalem in East Godavari district on Sunday. The owner of the mobile phone Bhavana Suryakiran sustained a serious injury on his thigh. The phone caught fire when he was driving his bike from home to his shop with his smartphone in the pocket of his pants. It could not be pulled out as it was burning. Locals came to his rescue, poured water on his pants before they were able to pull it out. However, the Smartphone was still on fire even after they threw it out.Suryakiran said he bought the RedMi Note 4 smartphone 20 days back and he will take the issue to the court over the faulty piece as well as for compensation for his injuries.